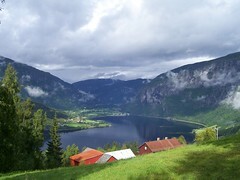 By now we were becoming regulars on the 08:55 bus out of Ulvik. Today our destination was not far – the nearby town of Granvin. 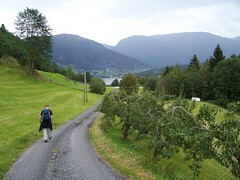 The intention was to walk the old post road back to Ulvik – the road that locals used to take to meet up with the postman before a main road was built to connect Ulvik with Voss. It seemed that as soon as we’d asked for Granvin, the driver knew we wanted to go on the old post road. Which was probably why he got a little confused when we got off at Granvin village centre, rather than the church. 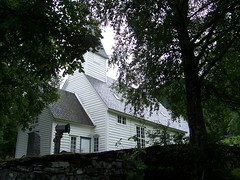 Unfortunately there was some confusion – some leaflets (specifically the guide to the Hardangerfjord) list the start of the Old Post Road as near the Church which is a couple of kilometres away from where we got off the bus in Granvin village centre. Despite him inviting us back on the bus again, we decided to walk the way to the church. Besides, we could pop in the supermarket and get some sweets this way. And it was a lovely day. Actually it wasn’t. It was grey, damp, miserable and overcast, but lets not use that as an excuse for not getting back on the bus. I mean, we had all day to kill so why not walk along from Granvin to the church? Yeah, we were doing this sans-map. 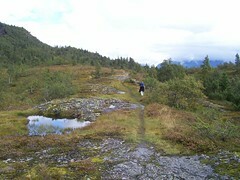 We were buoyed on from our experiences in Balestrand where we’d done literally two successful walks along very well marked paths, and managed to get back without getting lost. And as the Old Post Road was a well marked path, what could really do wrong? Shall we start with not actually being able to find the Old Post Road in the first place? We actually ended up wandering up and down the main road looking for signs before I eventually decided that, hey, we must have to go up, so lets go up this unmarked road that goes up the hill, and hope it gets us somewhere. Indeed it did. It got us on a road going up. A triumph of navigation! The road went up the hill, taking us past various houses before meeting up with another road – road 572. 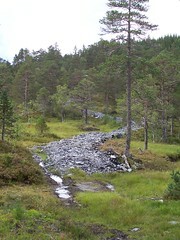 This is the old main road between Ulvik and Granvin – used before the 7km Granvin tunnel was opened – but it wasn’t the Old Post Road. Still we had two options. Go up, or go down. Knowing that the Old Post Road went up over the hill, going down wasn’t really an option. Wandering up a near deserted main road, we finally found a sign pointing off onto another, more gravelly road. 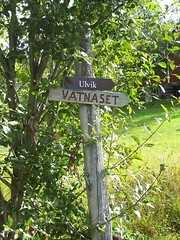 It was marked “Vindal and Vatnaset”. We had no idea where either of these places were, but on a whim, decided to follow it regardless. It was only later on when we’d dug out the scant (and highly inaccurate!) Hardangerfjord guide leaflet that we found out that this was actually a good move – although we didn’t know it, a hunch had led us onto the old post road at last! We kept going up and found ourselves walking through a small hamlet. Again the lack of signage led to more guesswork on direction, and it appeared that our guesses seemed to lend us to good stead. 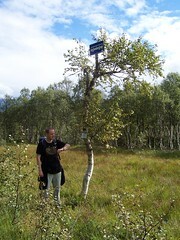 After ninety minutes on this “well marked path” we finally found our first sign. 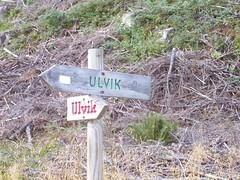 Yes, Ulvik was in the direction we were going! Hurrah. As if to celebrate, the clouds slowly began to part (temporarily) from the sky. Following the road to Ulvik we found ourselves in a reasonably busy (well there were around five vehicles) car part, despite having not seen anyone. There was also a stair lift, and a very strange gravel path, but no one in sight. Indeed we hadn’t seen anyone since we started out walk. The car park was explained shortly as we found the road quickly morphed into an inhospitable track complete with slippery rocks – inaccessible even to the best 4×4 – at the top of which were a number of dwellings. Presumably people park in the car park and hike the rest of the way up to their holiday home or farm. Sadly the weather was no longer with these two hikers – rain began shortly after. 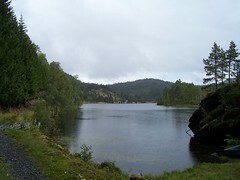 After about forty five minutes, we came across a lake with several small homes/farms around it – this was Vatnesetunt, named after the Vatneset farm. Or is it the other way round? Who knows. 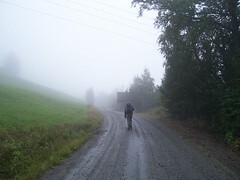 Anyway, Vatneset is a summer farm and the whole thing is remarkably remote and cut off with no road access. Despite that, there were people to be seen on the other side of the lake as we sat down and ate our packed lunch from the hotel, which we followed by a few wild raspberries which were growing nearby. Rested and relaxed we headed on. 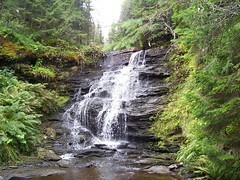 We walked on, clambering through boggy grass and marsh, plus slippery rocks. The “well marked path” continued to be hmm… yes… so… well marked… Thankfully our guess work continued to hold us in good stead, especially when we came to a junction in the path where not a single sign was to be seen. Whoever was in charge of signage was doing a stunning job, especially when, about 300m further along, we did find a sign pointing us the right way in a place where there was absolutely zero chance of anyone screwing it up! To add to the confusion we then found a bus stop. Now lets take a moment to reflect on this. We’re not on a main road. In fact we’re not on ANY road. But there’s a bus stop. Complete with timetable. Well okay, it’s a bus stop sign that someone has stuck on the top of a tree for reasons which are… well best known to them. There’s also a timetable for the local bus service, although that just proves that it’s not a real bus stop as we hadn’t seen a single bus timetable attached to a bus stop during our entire stay in the country! As there wasn’t a bus due for a couple of hours, we plodded on into a forested area complete with multiple, very large ant-hills, and a very nice waterfall. 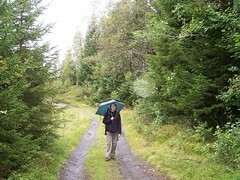 Thankfully our guesswork on which path to follow seemed to be at the end, as we met up with a couple of “Car Walks” which came from Ulvik and were, by all accounts, well marked. Well if you call three signposts next to each other, all saying “Ulvik” and pointing into three completely different directions “well marked”. Yet again we had absolutely no idea which was actually the old post road, so we picked one at random and went down that. And yet again, luck was on our side as it (amazingly) turned out to be the correct one which led us slowly down hill and into Ulvik. Ice cream and relaxation later and it was time for tea. Obviously our last night in Ulvik was enough to celebrate as we actually got a starter – a rather nice leek soup. Unfortunately things went down hill for me there. Whilst Catherine had (what I’m told was) a rather nice lasagne and salad, I ended up with a rather tough pork chop. Oh and our old friend, the potato wedges were back… Quite what the obsession with potato wedges was at the Ulvik Fjord Pensjonat, well I don’t know. It did however transpire that instead of cooking for us, Paul the hotel owner had been playing taxi driver, bringing a local hiking group over for their tea. Maybe if he’d actually been looking after the rest of the guests, we would have had some proper potatoes. And maybe a desert that actually tasted of something, cos I’m dammed if I know what the odd purple mouse we had was supposed to be. Funnily enough, the state of the food was the subject of many discussions we had with fellow inmates that evening. The guest book was full of comments about the great food, and Norwegian theme evenings. It’s just a shame we didn’t get to experience anything like that whilst we were there. Other comments seems to revolve around the fact that everyone was in what some called the “cow shed” – the annex next to the stream which did look rather shed like – rather than the main building.